Welcome to my latest obsession…I cannot get over this nail polish. I got acrylics done about 2 weeks ago now and this was an OPI colour they had at the salon, an unnamed shade that I now know was a part of a limited edition series and is no longer available to buy - I can't even find it on eBay *cries*. 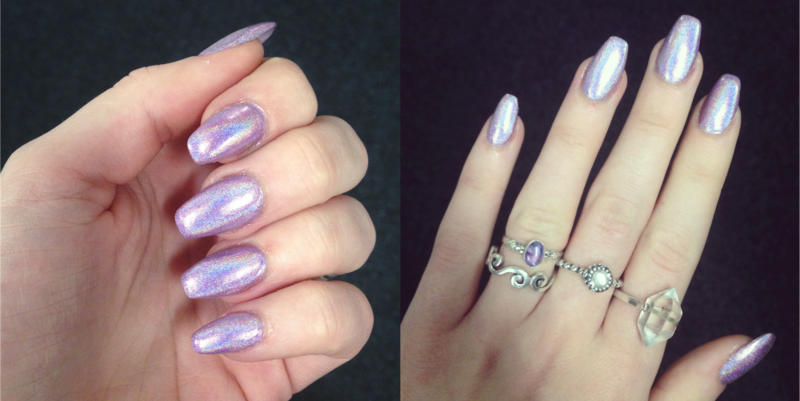 This is the most perfect, truly holographic polish and to make it even better it's got a lilac/pink base…if I was a nail polish I'd want to be this one. Oh my gosh these are so, so gorgeous. Holy crap, this looks amazing! Nooo! You can't even find it on ebay? It's so pretty!!! Wait, you show us this amazing color but then tell us it isn't available and you don't know the name? Booooo! I think it might be OPI Designer Series "Amethyst"?